Keeping up with the laws and regulations regarding worker’s compensation in 50 states and the District of Columbia is challenging, yet essential. And not only because employers, insurers, and all affiliated partners and vendors must comply with the laws of all jurisdictions in which they operate. Regulations inform business strategy, providing foresight into products and services that may be needed in the future, as well as risks that should be mitigated. By incorporating relevant regulations into pharmacy benefit programs, they also provide tremendous opportunities to set benchmarks and measure the success of patient care and cost saving programs. A recent review of workers’ comp legislation – proposed, pending, and passed – reveals some trends that have continued to gain momentum throughout 2018 across multiple states. First responders who face unusual risks in the line of duty, such as police and firefighters, are gaining some extra attention and expanded coverage for post-traumatic stress disorder (PTSD) and some cancers. 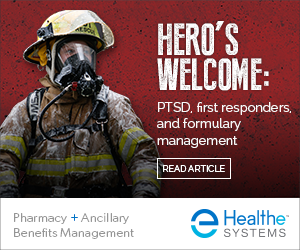 PTSD: Increased awareness of PTSD and its potential link to workplace trauma, along with a push to destigmatize mental illness, has led to efforts to expand PTSD injury coverage for first responders. While PTSD as a result of physical injury has long been covered in a majority of states, this newer wave of legislation is breaking ground by expanding coverage for “mental-only” PTSD injuries. As of October 1, a new Florida law went into effect recognizing PTSD as an occupational disease without requiring any connection to a physical injury. Washington, New Hampshire, and Minnesota recently passed similar bills and efforts are underway in other states, including Connecticut, Ohio, Arizona, and Utah. Cancer: Most states now recognize certain cancers as occupational diseases for firefighters, including the recent additions of New Hampshire and Hawaii. Bills that would make these cancers compensable have been introduced in Montana, Florida, and New Jersey, and Virginia is considering legislation to expand coverage for more types of cancers. What this means: Covering PTSD independently as a mental-only injury will likely increase the number of claims for the disorder, as well as demand for drug therapies and psychiatric visits to treat it. Demand for specialty drugs to treat cancer is also likely to rise as more cancers become compensable in more states. Payers for states, municipalities, and affiliated private organizations, such as security firms and emergency healthcare providers, will likely be impacted by requirements for expanding first-responder coverage. Even though the U.S. Drug Enforcement Agency (DEA) still classifies marijuana as a Schedule 1 drug, its use for medical purposes is now legal in 30 states and the District of Columbia – while voters in Missouri and Utah will have the opportunity to vote on the issue of legalized medical marijuana during this month’s mid-terms. In states where it is legal, we are seeing an expansion of qualifying conditions for the lawful use of medical marijuana to include chronic, severe or intractable pain, muscle spasms, seizures, and PTSD. New York and Illinois recently took this a step further to include opioid replacement as a qualifying condition; both states now have programs allowing patients to replace their opioid prescriptions with medical marijuana. The issue of reimbursement in workers’ comp is more controversial: five states have found medical marijuana to be a permissible medical expense, reimbursable by worker’s compensation insurance, while a number of other states have passed laws specifically stating that medical marijuana is not a reimbursable expense. What this means: Support for medical marijuana has increased significantly in recent years, but as long as it is a Schedule 1 drug, marijuana will not be appearing on any drug formularies. However, early studies indicating that marijuana may be a safe and effective alternative to opioids hold promise and could bolster the argument for reclassifying the drug. In the meantime, work-arounds, such as the replacement programs in New York and Illinois, may spread to other states. Lawmakers across the country continue efforts to curb the opioid epidemic using regulatory measures. A growing number of states are limiting initial opioid prescriptions, including South Carolina, Oklahoma, Missouri, and Colorado, all of which passed laws limiting initial prescriptions to a seven-day supply. Tennessee has passed a law limiting initial prescriptions to three days and California and Florida are also moving forward on bills that would limit initial prescriptions to three days. More than 30 states now limit initial supplies on opioid prescriptions. Other measures being implemented go beyond setting durational limits to address patient and provider education. Hawaii passed a law that requires providers to adopt an informed-consent process before prescribing opioids to injured workers, and Massachusetts is considering an opioid-limited formulary. North Carolina has published an opioid utilization guide and Pennsylvania has released opioid guidelines for the safe and effective treatment of injured workers. Of course, regulatory measures are only valuable when they are being adhered to, and a critical component of ensuring the success of these measures is tracking prescribing behaviors. The Texas Division of Workers’ Compensation published an audit of opioid prescribing habits and record-keeping to ensure that health care providers adhere to the Official Disability Guidelines (ODG) and medically accepted standards of care for prescribing opioids. The Centers for Disease Control and Prevention (CDC) has requested the formation of a workgroup to estimate, or provide reference points for, opioid prescribing for acute and chronic pain, particularly measuring how well prescribers are following the opioid prescribing guidelines the CDC launched in 2016. What this means: The opioid crisis is a long way from over with over just under 48,000 opioid deaths estimated to have occurred in 2017.1 But stringent opioid management programs have been successful in reducing opioid prescriptions, and they can become even more effective with additional support from the states, as long as regulatory measures are being driven effectively through workers’ comp pharmacy programs. More states are adopting worker’s compensation drug formularies. Ten states (TX, OH, OK, TN, DE, ND, AZ, WA, WY, CA) have established formularies and New York and Arkansas are just beginning implementation of their formularies. Kentucky and Indiana recently passed laws requiring the creation of drug formularies for workers’ comp. Formulary bills were put to a vote in Massachusetts and Pennsylvania but did not pass, although Massachusetts is now considering an opioid-only formulary. The opioid crisis and high pharmaceutical prices are driving more states to use formularies as a way to combat opioid addiction and rising drug prices. At least a dozen states have passed laws requiring drug formularies for workers’ compensation, and the two pioneering states, Texas and Ohio, are touting good results, which likely means that this trend will continue. What this means: The large and fast-moving influx of state-specific formularies can present great complexity for payers operating nationally or in multiple jurisdictions – but to date, closed formulary states such as Texas and California have seen positive results in addressing concerns such as opioid over-utilization. The key is effective and timely implementation paired with a supportive pharmacy program infrastructure that drives formulary adherence at every stakeholder level throughout the claims process. A clinically-driven population management approach, with the ability to integrate and layer state drug formularies with existing medication plans and customize based on the needs of worker populations (such as first responders who might require medications for cancer or PTSD that may not typically be reimbursable for more general workers’ comp populations). The wave of legislation in response to the opioid crisis presents an opportunity to integrate additional controls within the claims approval process to support adherence to these regulations at the claims adjuster, prescriber, and pharmacy levels. Inclusion and tracking of outcome-based metrics that align with regulations, such as reducing MED levels and opioid therapy duration, can simultaneously enhance patient care and optimize cost savings. Workers’ compensation regulation is an ever-evolving collection of rules and laws that can be challenging to keep up with. However, staying on top of those changing rules and implementing them strategically – with a focus on patient care and operational efficiency – will reap benefits far beyond compliance for your organization.